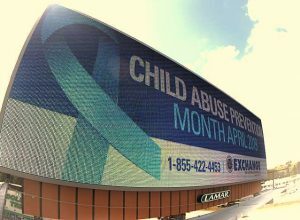 The Exchange Club of Richmond Hill has launched their annual “Believe in the Blue” Child Abuse and Child Neglect Awareness project with the placement of an electronic billboard on a busy highway. This spot was chosen because of the high traffic count of nearly 34,000 vehicles per day, many of which are Bryan County residents and workers. “Believe in the Blue”, introduced in 2007 nationally and locally, is an effort to reach families with helpful, positive parenting tips. Exchange believes parents have the power to make positive parenting choices in the lives of their children, and the Exchange Club of Richmond Hill is offering some easy-to-use tips to help all parents. Interested parties may contact the club’s Child Abuse Awareness Chair, Laura Evans at 912-756-5113.